Rosemary Blue Cheese Mashed Potatoes – Go Blondie! 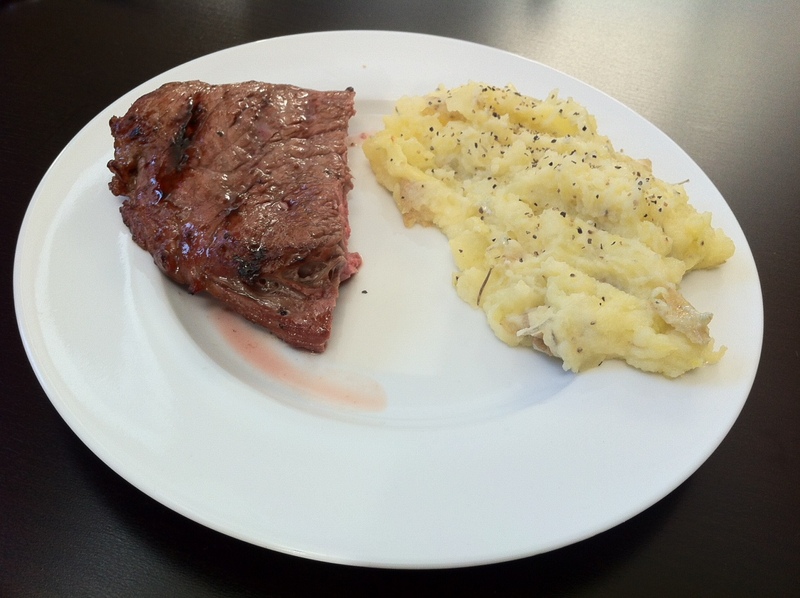 On Sunday night, Carl and I made steak and I tried a new yummy mashed potato recipe. I found the mashed potato recipe from a blog that I follow on wordpress. This blog is such a fun blog because she has a lot of fun recipes, crafts and DIY projects. Her blog is mixedmethod. We marinated our steak in a Jack Daniels Sauce. The nice thing about this marinade is that it came in a marinade bag and all we had to do was put the steak in the bag! Super easy. We had the classic steakhouse. The recipe is on her blog under recipes- Rosemary Blue Cheese Mashed Potatoes. Butter a 6 to 8 cup shallow baking dish. In a small saucepan, heat the butter, garlic, rosemary and pepper, to taste, until the butter is melted. Allow it to sit over very low heat to infuse flavors and keep hot while cooking the potatoes. In a large pot, cover the potatoes with water and bring to a boil over medium heat. Reduce heat and simmer the potatoes until fork tender, about 15 minutes. Immediately drain the potatoes and put them back into hot pot over very low heat, to dry them out. Next, mash the potatoes. If you have a ricer or food mill, pass them through that. Remove the smashed garlic from the warm butter and rosemary infusion and whisk in about 1 cup of the blue cheese. By hand, mix the cheese sauce into the potatoes and season with a little salt and pepper, to taste. Spread potatoes into the prepared baking dish and top with remaining blue cheese crumbles. Broil until the cheese is golden and melting, 3-5 minutes. Remove the potatoes from the oven and serve. Aren’t they delicious?! Glad you liked them – yours look great! We have used that marinade often with the stuff Steve shoots. We’ve actually put meat in those bags, left them in the frig for a day or two and then froze them until needed, wonderful! It was a good marinade. Derek had us try a weber marinade that is in a packet, that was really good too.